How to set different rewards based on the plan id? Plan level rewards is a very useful feature in case you want to set a different reward/commission level based on the plan the user signs up. For example, if you don't want to offer a % based commission, you can set a fixed commission amount for each plan. Another use case is when you offer custom or enterprise plans and you don't want to keep the same commission as the other plans. Like with the normal referred sale rewards, you can set plan rewards both at the campaign level or promotion(affiliate) level. 1. 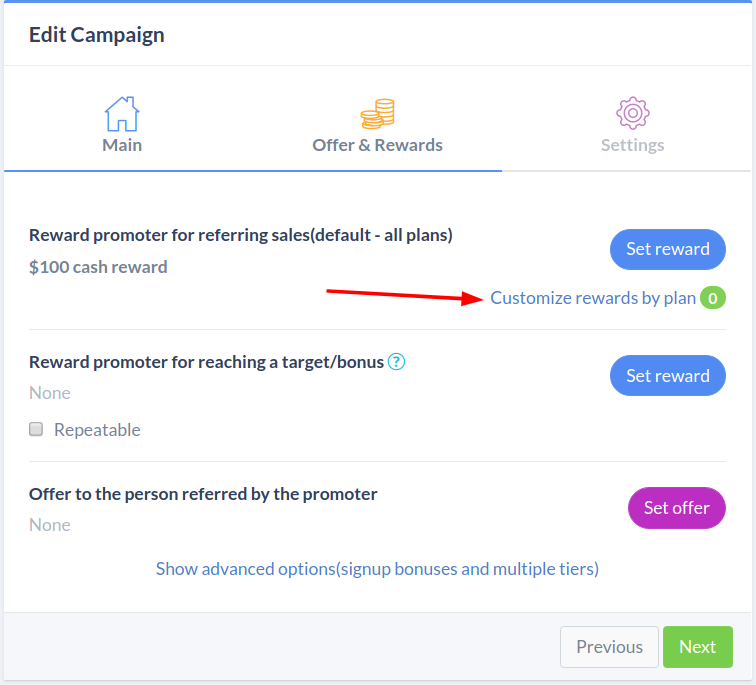 Edit the campaign or promotion, go to Rewards tab and click on 'Customize rewards by plan'. 2. Click on the "click here to add and manage plans" link. It will open the link in a new tab. 4. Set your plan name and plan(s) id. The plan ids are the ones from the billing provider(Stripe,Recurly, etc). By clicking 'Add another plan', you can enter multiple IDs in case you have multiple variants of the same plan or you want to set the same reward for a group of plans. 5. Click 'Save'. Once you finish adding the plans, go back to the previous browser tab and click the 'Refresh' link to see the new plans.